All prints are available unframed and shipped in tubes .... or pre-framed by our experts. The BigB prints we offer are classy, clever, and well presented, perfect for YOUR CUSTOMERS. The cars and girls are not insane or pornographic, the humor and skill of BigB artwork is a result of his 25 years experience in marketing and advertising. We say that BigB creates lowbrow art that won't scare the dog. More accurately, BigB art is Retro Metro. We at Pinnacle Pacific Galleries want to assure you that we are the sole and exclusive publisher of BigB artwork worldwide. 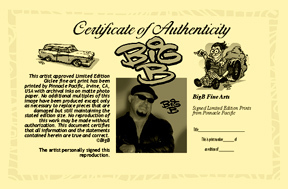 Each comes with a Certificate of Authenticity. We print and ship on demand, and we watchdog the quality control right here in Irvine, California. We ship UPS to the Continental US and Hawaii only. All orders are prepaid, we accept all major credit cards. Call us direct for exceptions to this policy, we'll talk. BigB personally inspects, approves, signs and numbers each print. The giclee prints are the current state of the art: 8 color high-resolution giclee printing with archival inks on heavy acid-free art paper. Call us during work hours West Coast time, and we'll direct you to our wholesale price list, where you will see clearly that selling BigB art prints is profitable. This art category is growing in popularity at a wild rate, and while much of the "lowbrow or nobrow" art may be disturbing and too "fringe" for your art buyers and collectors, we believe that BigB retro art is more accessible and clever, perfect for galleries in tourist and high traffic areas. And BigB art brings a smile to people, it lightens the place up! Regarding the framed and matted prints, we choose a clean modern black frame with white bevel matte, so it will fit into any decor or home color pallete. We finish the backs with paper and hanging hardware, very proffesionally done. You can stamp your gallery's logo and phone on the backs if you like. Each print ships with a Certificate of Authenticity, assuring you and your customers of the prints value and collectability. Framed prints ready for shipment. Hurry and order BigB prints!